But I am hoping I will have a lot more time and energy to cook and blog over the coming months since I am now only working part time. Last night I made this delicious scallop recipe from, my favorite, the Barefoot Contessa. The scallops were quite simply prepared and served on top of a puree made from Yukon Gold potatoes, leeks, and celery root. Note that the recipe calls for grapeseed oil. It has a higher smoke point than the oils you likely have in your pantry which is important when you are searing at a high temperature. I followed the instructions on how long to cook the scallops and they turned out perfectly. The potato-celery root puree was super simple but delicious. It’s a great and lighter alternative to regular mashed potatoes. I used a combo of milk and heavy cream. If you like scallops, I definitely recommend this recipe. And, the puree may become a new side dish staple. Melt butter over medium heat in a large (8″ to 10″) saucepan or Dutch oven. Rinse leeks well in a colander, spin dry in a salad spinner, and add to pot. Sauté over medium-low heat, stirring occasionally, 8 to 10 minutes, until tender but not browned. Add potatoes, celery root, cream, 4 tsp. salt, and 2 tsp. pepper to the pot, stir, and bring to a boil. Lower heat to very low, cover pot, and simmer gently 25 to 30 minutes, stirring occasionally, until vegetables are tender. Be careful—don’ let the vegetables scorch on the bottom of the pan! In batches, pour mixture into the bowl of a food processor fitted with a steel blade and pulse until coarsely pureed. Taste for seasonings, return to saucepan, and keep warm over very low heat. If mixture gets too thick, add a little more cream. If it hasn’t already been removed, peel off the tough strip of muscle on the side of each scallop. Pat scallops dry with paper towels and season generously on both sides with salt and pepper. To serve, spoon warm puree onto 6 plates. 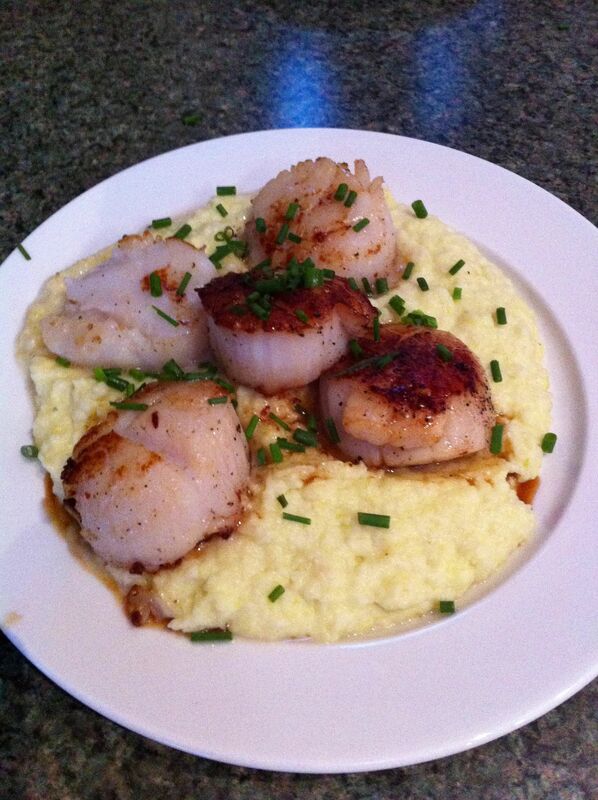 Place scallops on puree, drizzle with basil oil (if using), and sprinkle with chives. Greek yogurt has become a staple in our house. Charlotte has a bowl of FAGE with fruit every morning. She loves the taste and I love that it does not contain the added sugar so many of the kid yogurts have. But Greek yogurt is not only for breakfast! Use it to help make dinner more interesting. It’s a great marinade for grilled chicken. And, I can never get enough tzatziki which is a delicious accompaniment to Mediterranean Turkey Burgers or Chicken Gyros. The other afternoon when I was trying to decide what to cook for dinner, I saw the container of FAGE in our fridge. 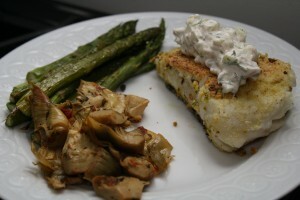 I decided to look up recipes using Greek yogurt and came across this halibut recipe. It looked light and flavorful — perfect for the week after Thanksgiving! This recipe was so delicious! 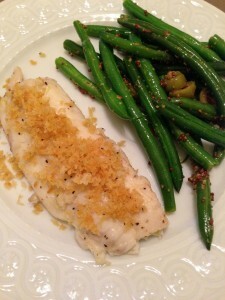 The cornmeal and pistachio crust on the halibut gave it a great crispy flavor. The spicy yogurt sauce was basically a spiced-up tzatziki. It was delicious! I loved it on the fish and only wish there had been pita to eat with the extra sauce. I served the fish with roasted asparagus and artichokes but a Greek salad would have also been a great addition to the meal. Tim and I were momentarily transported back to Greece as we enjoyed our dinner and reminded of the amazing time we had on Corfu five (!) years ago. 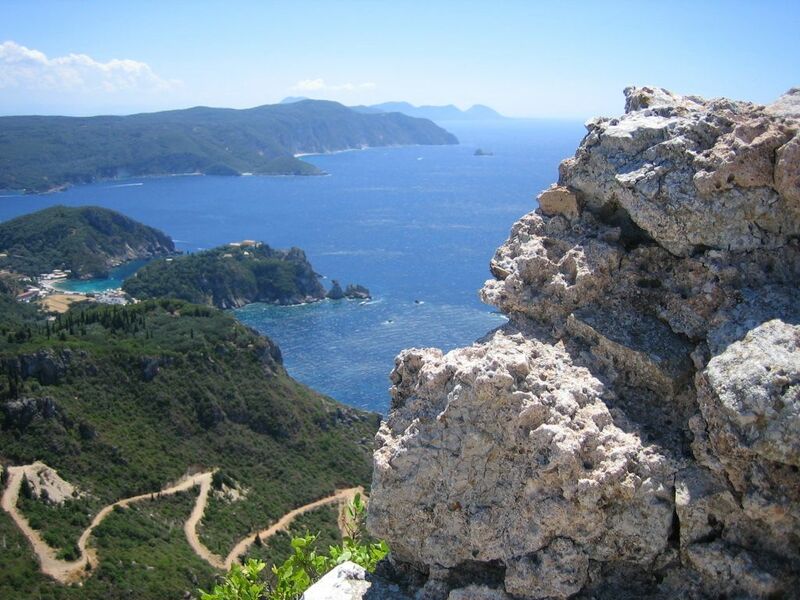 I’ll never forget the island’s breathtaking coastline and vistas. And, of course, I’ll always remember the delicious food and hospitality of the Greek people! Put fish in a shallow baking dish, pour milk over it, and chill, covered, turning over once, 30 minutes. Meanwhile, stir together pistachios and cornmeal in a shallow bowl. Remove fish from milk, letting excess drip off. Transfer to a plate and sprinkle all over with salt and pepper, then dredge lightly in cornmeal-pistachio mixture. Transfer to a clean plate as coated. Heat oil in a 12-inch heavy skillet over moderately high heat until hot but not smoking, then sauté fish, turning over once, until golden and just cooked through, 6 to 8 minutes total. While fish cooks, stir together all ingredients for spicy yogurt. Serve fish with spicy yogurt on the side. We’re very lucky — our Charlotte is a great eater! She loves broccoli, green beans, fruit, and cheese and is even willing to eat fish! Charlotte loves these fish sticks! 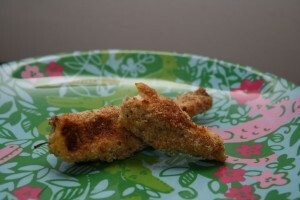 They are so easy to make and you can make a big batch and freeze a portion. I’ve made these using tilapia but you can make with any firm fish. Cut tilapia filet lengthwise along the center. The cut the smaller filets horizontally into fingers. Dip the fingers into the egg and then the breadcrumbs. Place on a very lightly oiled cookie sheet. 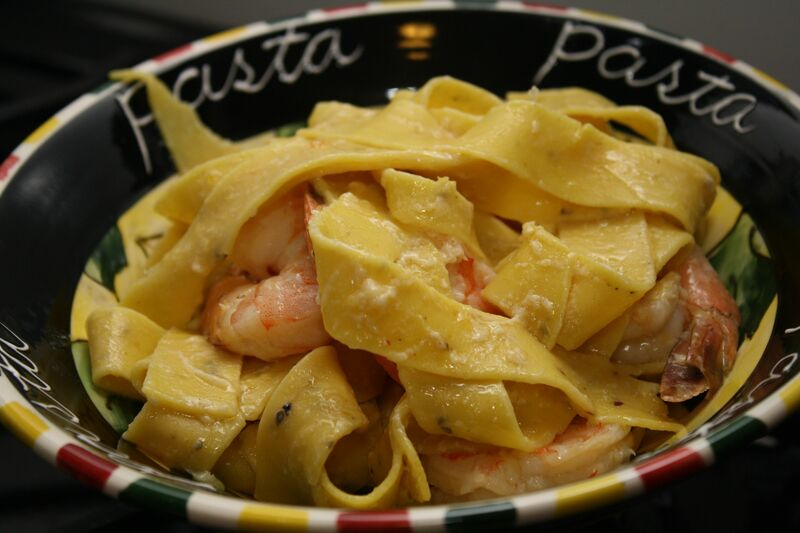 Here is a quick and easy pasta dish from the Barefoot Contessa. I just loved the lemon flavor with the roasted shrimp! I did make a few changes to the recipe though. Instead of angel hair, I used Trader Joe’s Lemon Pepper Pappardelle which added more flavor to the dish. I added some minced garlic and red pepper flakes to the shrimp before roasting. Lastly, I know this is a major faux pas in Italian cooking but I mixed in some grated parmesan to the pasta before adding the shrimp. I’ve never gone wrong with the Barefoot Contessa! This probably isn’t my all-time favorite Ina Garten recipe but it is solid and great for a weeknight dinner! Place the shrimp on a sheet pan with 1 tablespoon olive oil, 1/2 teaspoon salt, and 1/2 teaspoon pepper. Toss well, spread them in 1 layer, and roast for 6 to 8 minutes, just until they’re pink and cooked through. Meanwhile, drizzle some olive oil in a large pot of boiling salted water, add the angel hair, and cook al dente, about 3 minutes. Drain the pasta, reserving some of the cooking liquid. Quickly toss the angel hair with the melted butter, 1/4 cup olive oil, the lemon zest, lemon juice, 2 teaspoons salt, 1 teaspoon pepper and about 1/2 cup of the reserved cooking liquid. Add the shrimp and serve hot. Here is a a quick and easy Asian-flavored salmon dish. The simple marinade — honey, soy sauce, Chinese Five-Spice Powder, and garlic — is packed with flavor. Five-spice powder is a mixture of — you guessed it — five spices. Typically, it contains cinnamon, cloves, fennel seed, star anise, and Sichuan peppercorns (white pepper or ginger are common substitutes). The spice blend encompasses all five flavors of sweet, sour, bitter, pungent, and salty, lending lots of flavor to the dish. The great thing about the dish is that you broil the salmon and the green beans on the same baking sheet so there is little clean up. I would suggest using haricot vert instead of regular green beans as they are thinner and will cook more quickly. 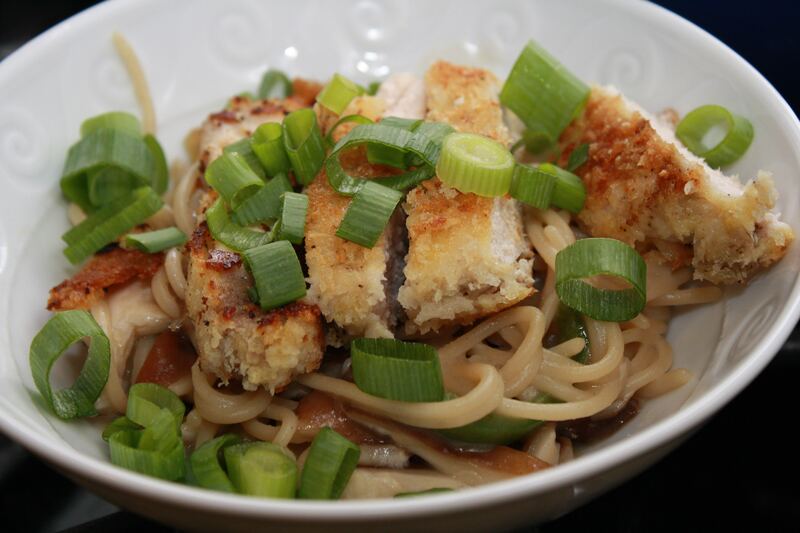 A light and flavorful dish — perfect as springtime approaches! Position a rack 6 inches from the broiler and heat the broiler on high. Line a large rimmed baking sheet with foil and coat with cooking spray. In a large bowl, toss the green beans with the canola and sesame oils. Arrange the beans on one half of the prepared baking sheet and season with salt and pepper. Arrange the salmon skin side down on the other half of the baking sheet. Brush the salmon with any remaining marinade from the plate. Broil the salmon and green beans for 3 minutes. Remove the pan from the oven, toss the green beans with tongs, and reposition the salmon pieces as needed so that they cook evenly. Continue to broil until the salmon is just cooked through and the beans are crisp-tender, 2 to 3 minutes. 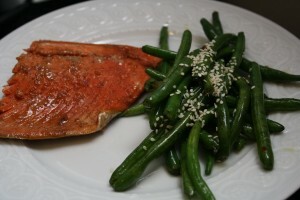 Toss the green beans with the sesame seeds and lemon juice and serve. I used to grocery shop multiple times per week. I would just pick up what I needed for dinner that night on my way home from work. That’s not a realistic option now that Charlotte has come along and I am working full time. Menu planning (and some shortcuts courtesy of Trader Joe’s and Fresh Direct) has become key to my weeknight cooking. October’s issue of Real Simple Magazine features a four-week dinner plan. Not having a ton of time to look for menu ideas, I decided to give Week 1 of the plan a whirl! I made 4 of the 5 recipes. They were all quite good but I thought the Penne with Tomatoes, Eggplant, and Mozzarella and the Pork Cutlets with Spicy Noodles really stood out! Real Simple provided a shopping list making my life even easier! I bought all of the ingredients on a Sunday and was prepared for a week of tasty, healthy eating! The four recipes I made are below. Very tasty! 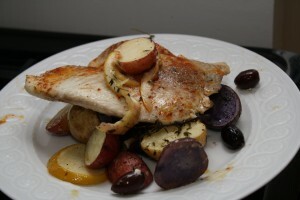 I used tri-colored fingerling potatoes which were tasty and provided some great color to the dish. The lemon and olives lend a great flavor to the very mild tilapia. Heat oven to 400° F. On a large rimmed baking sheet, toss the potatoes, lemon, thyme, 2 tablespoons oil, and ¼ teaspoon each salt and pepper. Arrange in a single layer. Roast, tossing once, until the potatoes begin to soften, about 20 minutes. 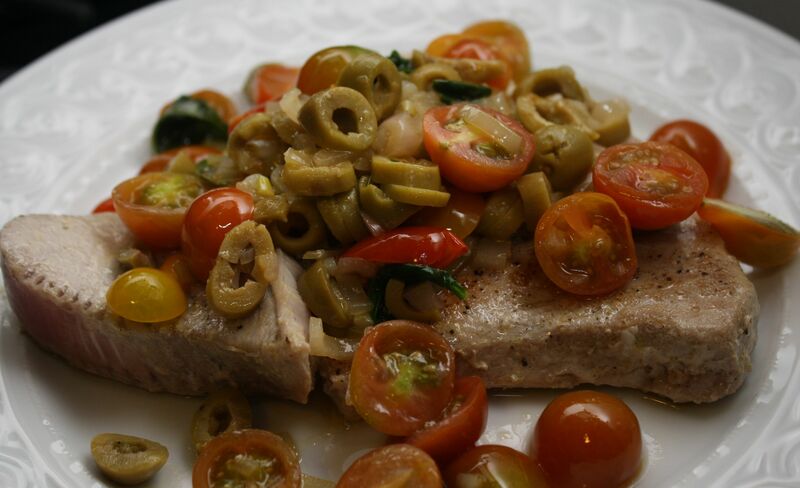 Toss the olives with the potato mixture; nestle the fish in it. Drizzle the fish with the remaining oil and season with paprika and ¼ teaspoon each salt and pepper. Continue to roast until the potatoes are golden brown and crisp and the fish is opaque throughout, 12 to 15 minutes. Delicious! I skipped the mint and used basil instead. I also added some grated parmesan. Cook the pasta according to the package directions. Reserve ¼ cup of the cooking water. Drain the pasta and return it to the pot. Meanwhile, heat the oil in a large nonstick skillet over medium-high heat. Add the eggplant. Cook, tossing occasionally, until golden brown and tender, 8 to 10 minutes. Add the tomatoes, garlic, red pepper, ¾ teaspoon salt, and ¼ teaspoon black pepper. Cook, tossing, until the tomatoes soften, 2 to 3 minutes. Add the tomato mixture to the pasta, along with the mozzarella and reserved cooking water. Toss to combine. Sprinkle with the mint. This was my least favorite of the four dishes but it was still tasty! To save time I used shredded carrots. And, we used sandwich thins as opposed to buns to save on calories. In a medium bowl, gently combine the turkey, mustard, thyme, and scallions. Form the meat into four ¾-inch-thick patties. Season with ½ teaspoon salt and ¼ teaspoon pepper. Heat the oil in a large nonstick skillet over medium heat. Cook the patties until cooked through, 6 to 8 minutes per side. Meanwhile, in a bowl, whisk together the mayonnaise, vinegar, and ¼ teaspoon each salt and pepper. Toss with the lettuce and carrot. Serve the burgers on the rolls, topped with the slaw. Serve with chips and pickles (if desired). This was delicious! I had trouble finding udon noodles so I used a brown rice spaghetti that I found at Trader Joe’s. The noodles had great flavor from the broth, ginger, and jalapeno. The pork was delicious as well! I used two butterflied pork chops. In a large pot, bring the chicken broth and ginger to a boil. Add the noodles and cook, stirring, until the broth is nearly absorbed and the noodles are al dente, 4 to 6 minutes. Add the mushrooms and jalapeño and simmer until the mushrooms are just tender, 1 to 2 minutes. Meanwhile, season the pork with ½ teaspoon salt and ¼ teaspoon pepper. Coat with the flour, then the egg, and finally the panko. Heat the oil in a large skillet over medium-high heat. Cook the pork until cooked through, 2 to 3 minutes per side. Slice the pork and serve over the noodles. Sprinkle with the scallions. Keeping with the French bistro theme, I made mussels several weeks ago. White wine, garlic and mussels….mmm…nothing is more delicious! I decided to try this recipe because I was intrigued by the addition of saffron and a touch of half and half to a more traditional white wine base. It was a delicious combo — definitely worthy of some crusty bread for dipping into the broth! Mussels must be thoroughly cleaned and rinsed several times before cooking. Wild mussels will need to be scrubbed with a stiff brush to remove any barnacles, sand or grit and their beard must also be removed. This can be done by giving the beard a forceful tug with your fingers and pulling it away or by cutting it off with a small and sharp knife. Rinse the wild mussels several times but do not let them sit in water, as freshwater will kill them. Farmed mussels will have already been prepared for cooking and it will suffice to just give them a quick rinse under a running tap of cold water. 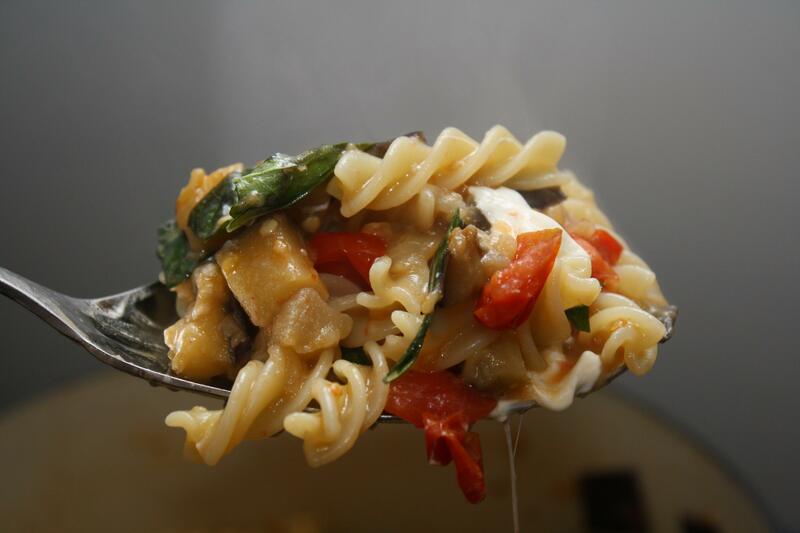 Mussels are super quick and easy to make and are always a crowd pleaser! Melt the butter in a large pot, then add the garlic. Sauté until the garlic is fragrant, about 1 minute. Add the wine, half and half, and saffron; simmer for 5 minutes. Add the clam juice, scallions, tomato, and lemon juice, scallions, tomato, and lemon juice; simmer for 5 minutes. Add the mussels, cover, and stream until they are open, about 5-7 minutes. Shake the pot, holding down the lid with a kitchen towel, to redistribute the mussels. Discard any mussels that do not open. Divide the mussels into eight bowls; distribute the broth equally among the bowls, and top each with fresh chives. Slowly but surely I am getting back into the kitchen making simple meals and relying on quick and easy recipes. I have a backlog of a few posts I need to write but hopefully you’ll see some more posts this week! Charlotte and I enjoyed some nice outings last week to Chelsea Market where I purchased some delicious fish from the Lobster Place and wonderful produce from the Manhattan Fruit Exchange. On one of our excursions I purchased some gorgeous wild King Salmon. The color on the good quality wild salmon is just so much more appealing and the flavor so much richer than the farm-raised salmon. The Everyday Food application on my iPhone sends me a new recipe each day. 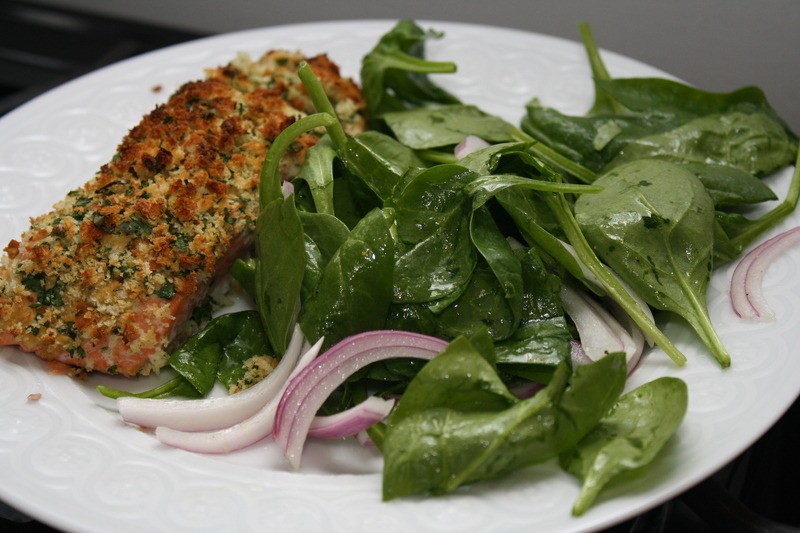 I received this recipe last week and it looked easy but packed with flavor and good-for-you ingredients — two super foods, salmon and spinach! The salmon I bought would have been incredibly flavorful on its own but the dijon mustard and herb crust gave it a little flavor boost! I didn’t have any white sandwich bread so I used a couple of leftover hot dog rolls from our Memorial Day barbecue. Any bread you have on hand will do. The lemon juice – olive oil combo is a great fresh and healthy dressing for any salad. This was a delicious and healthy meal I was able to prepare in between feeding Charlotte! Preheat oven to 450 degrees. Line a baking sheet with aluminum foil; set aside. In a food processor, combine bread, parsley, and 1 tablespoon oil; season with salt and pepper. Pulse until coarse crumbs form. Place salmon on prepared sheet; season with salt and pepper. Spread top of fillets with Dijon; top with crumb mixture, pressing gently to adhere. Roast until salmon is opaque throughout, 11 to 13 minutes. Meanwhile, in a large bowl, combine lemon juice and remaining oil; season with salt and pepper. Add spinach and onion; toss to combine. Serve salmon with spinach salad.